I have some very Exciting news for you. I have the most Amazing Competition Prize for you to win this month! Dead Sea Spa Magik. have kindly given me 2 Spa Magik Sparkling Luxury Gift Sets. 1 for me to review & 1 for one of you Lucky people! It's really important to start a good skincare regime at a young age to help keep your skin sparkling clean, soft and wrinkle free. Protecting your skin from the sun and regular home spa treatments can have a significant impact on the appearance of your skin. It sounds Fab, doesn't it? There was so much in the gift to review that I offered my Mother in Law Fiona the chance to take this one on. She's a huge spa products fan so she kindly jumped at the opportunity. Here's what she thought. Cleansing facial wash – The first time I used this I squeezed an amount about the size of a 10p piece. I wet my face and lathered it up and it turned into a thick creamy lather that cleansed my face beautifully but was far too much. The next time I used a spot about the size of a 5p piece and this was perfect. The thick creamy lather was like using a cold cream and it removed my make up and waterproof mascara with no trouble at all. After rinsing my skin felt rich and moist with no dryness. With the small amount you need to use the tube will last for months. Mild exfoliator – I used this after the facial wash. I only used a small amount as my skin is quite sensitive and I did not want to overdo it. However I had no need to worry, the granules in the exfoliator were so fine they glided over my skin and did not feel rough in any way. When I rinsed them off my skin positively felt rejuvenated, smooth and soft. Rich moisturiser – I smoothed a small amount of the moisturiser on after using the cleanser and exfoliate. A little went a long way, the cream was light and non greasy and was absorbed quickly leaving my skin feeling moist but not shiny. An added bonus is that there is UV and UVA protection in the cream. Salt brushing – It says on the instructions to use this standing in the bath. I did so and was glad because the crystals seem to go everywhere. As I rubbed it on my dry skin I thought this is doing nothing except make a mess, but I persevered and was I glad I did!! As I rinsed it off my skin felt like velvet with no dryness or soreness from the rub – it was fantastic. An absolute must use once a week. Bath shower gel – After I had washed off the salt brushing I had a long warm bath made soft, fragrant and bubbly with the bath shower gel. The gel made the water smell pleasantly with soft airy bubbles. Afterwards I used the gel as a shower wash using the pumpkin puff wash. The gel made a lovely soft rich lather with just a couple of pumps and washed me well without drying my skin. Mineral Shampoo – I washed my hair and the shampoo smelt fresh and clean. I only needed one wash to leave my hair squeaky clean. Magic serum – This is another miracle worker. I worked the serum into my hair as instructed, and left for a couple of minutes after combing it through. It rinsed out easily and I was able to comb it without any knots or tangles. The best bit was after I dried my hair, my hair felt like silk, soft shiny and smelt fresh. The following day my hair still looked like it was freshly washed and full of body. I am definitely going to be buying this product. Smooth body lotion – After my bath and shower, I applied the body lotion as a finishing touch. My skin was already smooth and felt nourished after using the salt scrub and shower gel but after using this lotion it seemed to seal in all the moisture and cool my skin leaving it smooth and dry. Fresh’n white – This toothpaste is a liquid type form. You use a couple of drops on your toothbrush and it makes a light, fresh, sort of foam, not heavy like toothpaste. It cleaned my teeth without feeling like I had a mouthful of paste. It can also be used as a breath freshening mouthwash. An excellent product. It sound like she had an Amazing time with this gift set. All those Wonderful Spa products in one Amazing Gift set! Thank you so much Fiona - You did an excellent job on that review. Wow So After that Amazing Review - Who wants to Win one?? To win This Amazing SPA MAGIK SPARKLING LUXURY GIFT IN CLEAR BAG all you need to do is the following 2 steps. 1 - You must Follow My Blog through Google Friends Connect using the "Join This Site" button found over on the right hand side of my Blog. "I want to win a Spa Magik Sparkling Gift from Mummy Of 3 Diaries." Once you have done BOTH steps 1 and 3 then please leave a comment letting me know that you have done this along with the best way to contact you if you win.
" I Want To #Win A Bit Of Dead Sea Spa Magik with @v82chris http://bit.ly/vrz3qH "
This Competition will close on November 20th. 1 lucky winner will be drawn at Random from all the correct entries. I left a comment on the facebook page. Following on Twitter and FB, Have tweeted @WISHGIRL123 but can't see any join the site button? I follow your blog, have followed Dead Sea Spa Magik's page and posted on their wall. Thankyou very much for the gorgeous giveaway! Following your blog on GFC and like and commented on Dead Sea Spa Magiks page. Hi, I've followed with Google Connect and liked Dead Sea Spa Magik's Facebook page and commented. I've done both steps (Missie Lizzie on FB). Already following you, have liked on Facebook & commented. Done both Chris thanks for running this! I also tweeted :) @greenandshiney ! I follow via GFC & have liked and commented on FB as Kim Carberry. would love to win need some mummy time as i do it all on my own with 3 kids please hope i win fan on facebook page as kim kirkwood. Lovely giveaway thank you!I follow your blog and i posted on dead sea magiks fb page. I follow your blog with GFC, have liked the Dead Sea Magik FB page and commented on it and tweeted @LindyHine. Thanks for a fab giveaway - this stuff sounds amazing! cant sign into my account for some reason so posting as anon .. 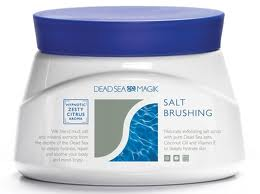 I've heard good things about this dead sea spa magik product.. ;) Going on my wish list now!